Dealing with mixed feelings of excitement and nervousness, last year the Latinos Unidos Vice President Juan Paz Ramirez and President Andres Gonzales attended the Castro Valley Unified School District’s (CVUSD) office to present an idea along with 1,000 signatures to support it. Cesar Chavez Day should be a service day for Castro Valley, they proposed. “He’s a hero of this nation, he deserves his day. I think it’s only right to have a day of service to honor him for his great achievement,” said senior Ramirez. His achievements are stacked high. Political activist Chavez worked in a time when Hispanic and Filipino farmworkers faced aggressive discrimination. By using nonviolent tactics, such as protesting, marching, fasting, and boycotting, Chavez fought for rights, which are still in place at your current or future job in America today. It may not surprise you to know that Chavez fought for workers’ rights: labor codes, protections, benefits, and increased pay. However, it may surprise you to know that Chavez’s activism didn’t stop there. Chavez served in the US Navy after WWII, supported gay rights in the early 1970s when it was extremely unpopular, and condemned the Vietnam War in the 1960s. It isn’t a question whether Chavez deserves to have a service day or not. 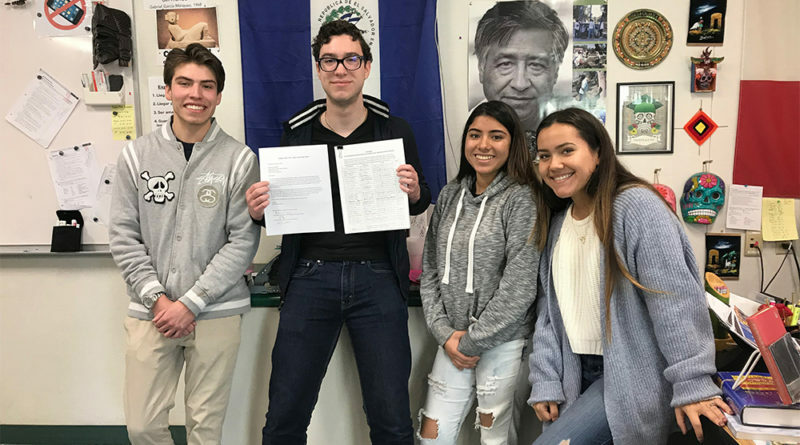 What is impressive is the immense effort members of the Latinos Unidos club put forward to collect 1,000 signatures by reaching out boldly into the community. “It was almost like a competition to see who could collect the most. Students went as far as knocking on doors and asking neighbors,” said teacher Antonio Acosta. Even more impressive is the fact that the club accomplished this in the span of only one week. Students of CVUSD will have no class on April 1, though employees will have a staff development day. Although it’s nice to have a day off from school, it should be spent in a meaningful way, such as giving back to the community.